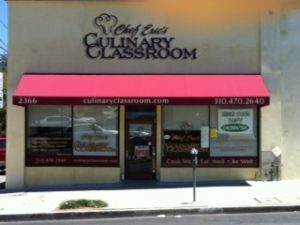 Chef Eric’s Culinary Classroom is one of the best cooking schools in Los Angeles. Chef Eric teaches hands-on cooking classes and gives you a technical education as a European-trained professional chef. Many students are aspiring professional chefs or current chefs who are seeking to improve their skills. Others just want to learn to cook and bake with a Pro! Since 2003 Chef Eric has been teaching thousands of students just like you to cook in his professionally designed kitchen, with high-end equipment, and a great calendar of professional programs and recreational classes to tempt your palate. Come take a class with him in his West Los Angeles Cooking School. The founder, owner and instructor at the Culinary Classroom, Chef Eric Jacques Crowley, draws upon his extensive career, highly regarded technical training, and education from the Culinary Institute of America, to mentor students in the art of cooking and baking, and in furthering their culinary careers. Chef Eric’s warmth and patience separate him from many temperamental chefs and enable his students to enjoy the process of mastering the culinary skills they desire. Chef Eric understands the path from a non-culinary career to a culinary career. His exposure to a wide range of cultures and foods during his childhood led him back to cooking when, after he detoured by studying music in college and working in the legal field, he felt that he wasn’t living his dream. At age 27, he found himself experimenting with his mother’s hand-written recipe book and soon after enrolled in the renowned Culinary Institute of America in Hyde Park, New York, where he excelled and graduated with honors. This is the high level of education he now passes on to his students. Students of Chef Eric’s Culinary Classroom also receive the benefit of learning the advanced techniques that Chef Eric developed while studying in Europe under Chef José Munisa at Via Veneto, Barcelona’s longest-running 5-star restaurant, as well as with Chef Joseph Russwürm at Munich’s Hotel Kempinski, another 5-star establishment. Chef Eric also generously shares the insights and skills he gained while working for Patina Catering, of the distinguished Patina Restaurant Group and preparing food for A-list celebrities, at award shows such as the Primetime Emmy Awards, Governors Ball, presidential candidates, vice presidents, show business executives, numerous catering events of all sizes, demonstrations and more. 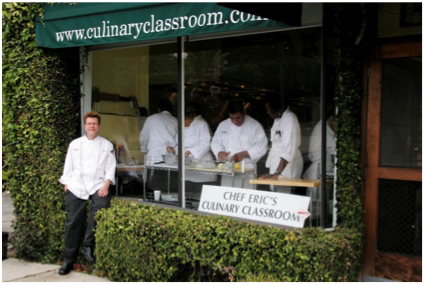 At Chef Eric’s Culinary Classroom, Chef Eric offers professional certification programs, which include the 14-week Culinary Master Chef Program and the 10-week Culinary Baking and Pastry Program. In these programs, Chef Eric personally trains aspiring and established chefs to provide them with essential culinary skills and advanced culinary techniques, sharing not only the education that he received at the Culinary Institute of America but also the experience he gained in his European travels and years in business. Students are then able to successfully launch and grow their culinary careers and businesses. Through his dedication and positive mentoring style, Chef Eric has significantly impacted his students, shaping their careers and enabling them to reach their professional goals. Some non-professionals also take these programs because they aspire to become high-level home chefs. For recreational cooks and home chefs, Chef Eric’s Culinary Classroom offers classes on couples cooking, healthy cooking, wine and food pairing, sushi making, cupcake baking and more. New classes are continuously being added to the calendar, based on customer’s requests, which is why Chef Eric’s Culinary Classroom began offering kids’ summer cooking and baking camps soon after opening. He recently created a Healthy Cooking Series and a Vegan/Vegetarian Series to keep up with the changing demographic. Many companies and law firms have come to Chef Eric’s Culinary Classroom for fun team-building events. “Taking people out of their daily routine and putting them in a situation where communication and cooperation are vital, is a great way to team-build,” says Chef Eric. “Throw in the tastes, aromas and beauty of delicious dishes, and you have a fantastic experience.” He also hosts private cooking parties for birthdays, anniversaries and other special events. For fans and customers throughout the U.S., Chef Eric handpicks culinary tools and kitchen gadgets that he sells in his online store. 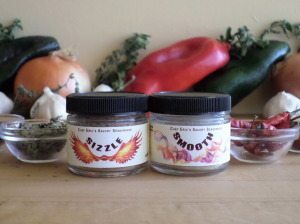 He is also the creator of Chef Eric Crowley’s Savory Seasonings, Sizzle and Smooth, a duo of spice blends that add the perfect amount of heat and fabulous flavor to all types of dishes. Each jar is blended by hand to ensure optimal flavor, with Sizzle adding a bit of fire to dishes and Smooth offering great flavor without that extra kick of heat. Through Coach Art, Chef Eric’s Culinary Classroom provides an opportunity for children with chronic and life-threatening illnesses to enjoy a day of culinary adventure and fun. Over the years, Chef Eric’s Culinary Classroom has donated thousands of dollars of cooking classes and scholarships to children in need. Chef Eric finds great reward in working with children, as he is inspired by the pure excitement that children express upon completing a recipe, and the important life lessons of team work, dedication and self-assurance that are instilled in his young students. Chef Eric’s mentorship extends beyond the Culinary Classroom. He is a judge and scholarship sponsor for the Careers through Culinary Arts Program (C-CAP) in the Los Angeles Unified School District, and he mentors children from high school into their professional careers. He is also a mentor for the Culinary Institute of America (CIA); supporting interns and students who want to become serious chefs, by training and preparing them, and personally guiding them through their requirements to attend the CIA. Extremely Satisfied -The best cooking class I ever attended. All the staff, and of course, Chef Eric, were the best. I am looking forward to taking the Master Baking and Master Chef Program soon! The program exceeded all expectations that I had when I signed up. Chef Eric is amazing, patient, and very knowledgeable…. Best 10 Weeks ever!